As containers increasingly displace virtual servers as the preferred virtualization model in the cloud space, it becomes critical for OpenStack operators and developers to understand this technology. In this introductory course, you will learn about what containers are, how they are used and how they are managed in general and with OpenStack specifically. Hands on lab exercises provide you the opportunity to build and deploy an application using the Docker container system model. A full agenda is available via the course link. OpenStack is the default solution for Private and Hybrid cloud development. This class is designed to help you understand what OpenStack is, how OpenStack and the OpenStack community fit into the much larger world of cloud computing and, perhaps most importantly, how to use this powerful cloud management system to control cloud infrastructure. Hands on lab exercises provide you the opportunity to experience the full range of basic OpenStack actions, from networking, to the deployment of virtual servers, to managing storage systems. A full agenda is available via the course link. This on demand course guides you through the full stack of application development from the underlying infrastructure up using open source software solutions. The course introduces using OpenStack as an infrastructure management tool, works through automating your infrastructure development and deployment with Terraform. You’ll then learn how to leverage a Continuous Integration/Continuous Deployment (CI/CD) processes to automate your application testing and deployment process on the infrastructure you've created using Travis CI and Ansible. As a bonus, we've included a section on how the use of Containers is changing these processes (and how they stay the same) in a world where virtual machines (VMs) and bare metal servers still have relevance, but are becoming less prevalent for application deployment. 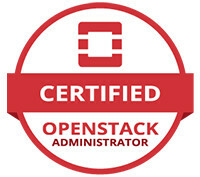 1) You know what OpenStack is and are generally comfortable using it. 2) You have access to your own OpenStack environment. This course will provide you guidance about what to expect from the exam process. How does it work, what is and is not allowed during the exam, what sort of format is the exam presented in? As understanding how to find information in the OpenStack docs is extremely helpful, we have provided links to appropriate content, organized by project. The course also provides you with example exam questions - these are not from the actual exam but represent the sorts of challenges you will be presented with. If you are able to comfortably resolve the problems posed to you in class, you should not have any issue passing the exam.